Caught Up with Dusk on Day Seventeen! …as seen from the other end of the table. Eight more blocks to come! Here is a closer look at Block 6, Lollipop Candy, that I finished today. 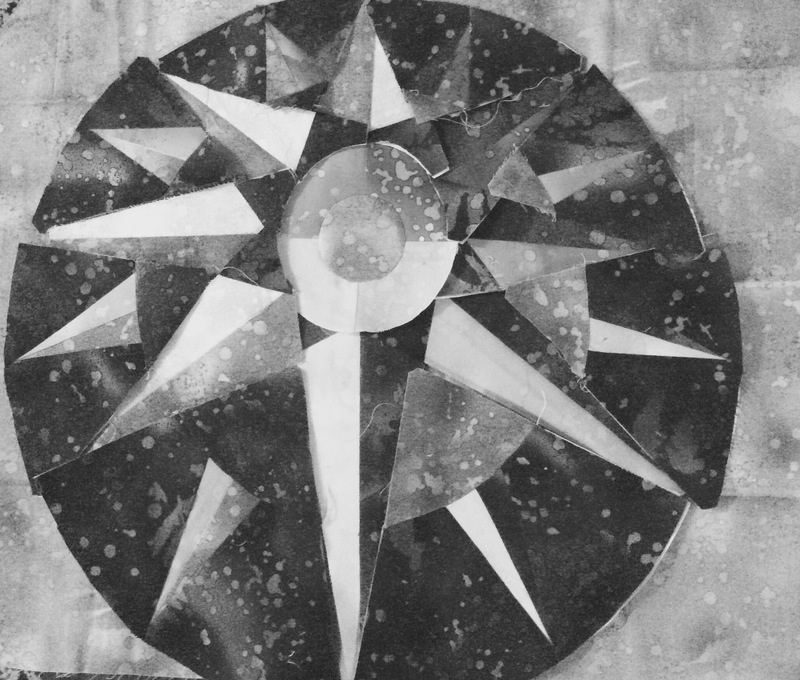 The original design had a deep blue centre. I am thinking now of a yellow. What colour should the centre be? 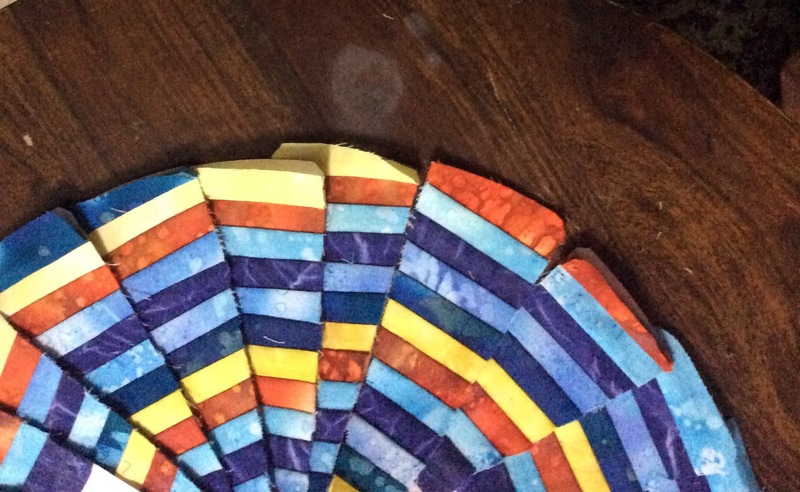 I don’t know why I thought I had made four blocks from the Rainbow version – it seems only three are done! 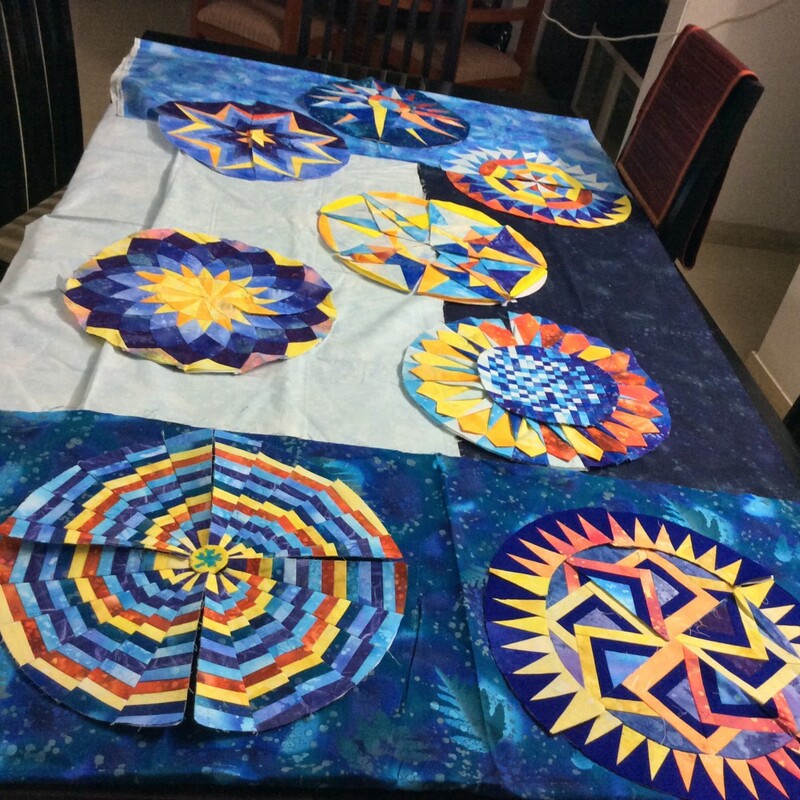 Only three blocks done – the rest will have to wait for next year! 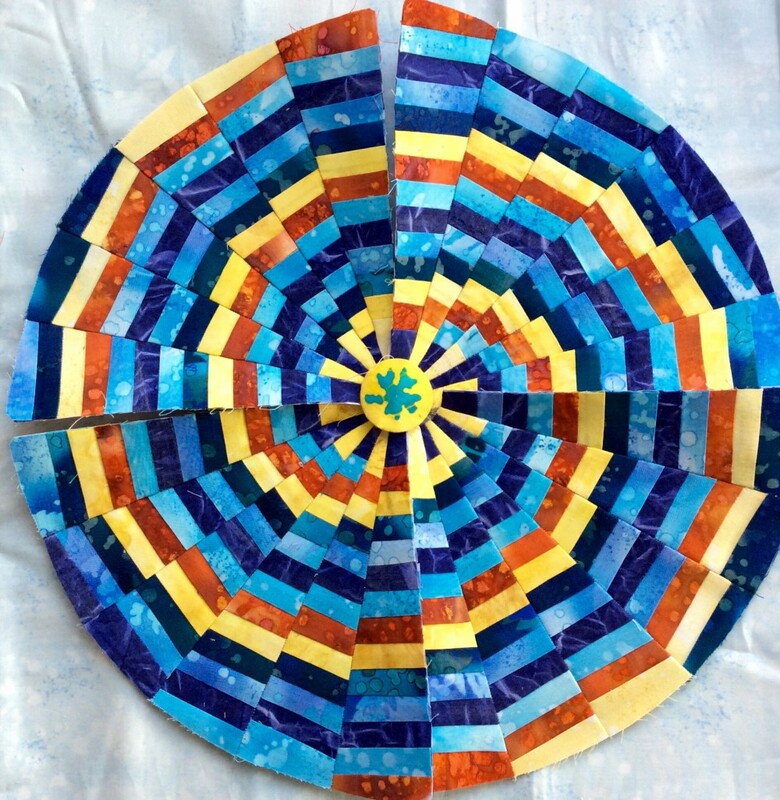 Would you like to make your own Round the Year Quilt? You can access all the free patterns on this page. Why don’t you join us from January 1st? You can finish this BOM in 2015! Today I have started working on Block Nine and will get back to you in the new year with a new block! Happy holidays to you all! 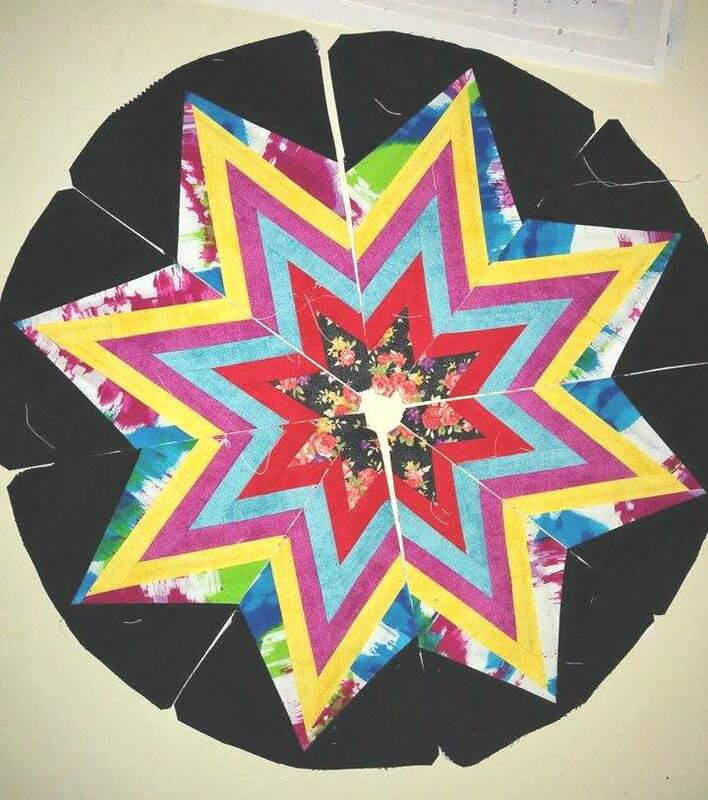 Author MadsPosted on December 26, 2014 April 13, 2018 Categories Come sit with me...musings, Patchwork of my life, Round the Year quiltTags BOM Quilt, Dreamcatcher Quilt, Round the Year quiltLeave a comment on Caught Up with Dusk on Day Seventeen! 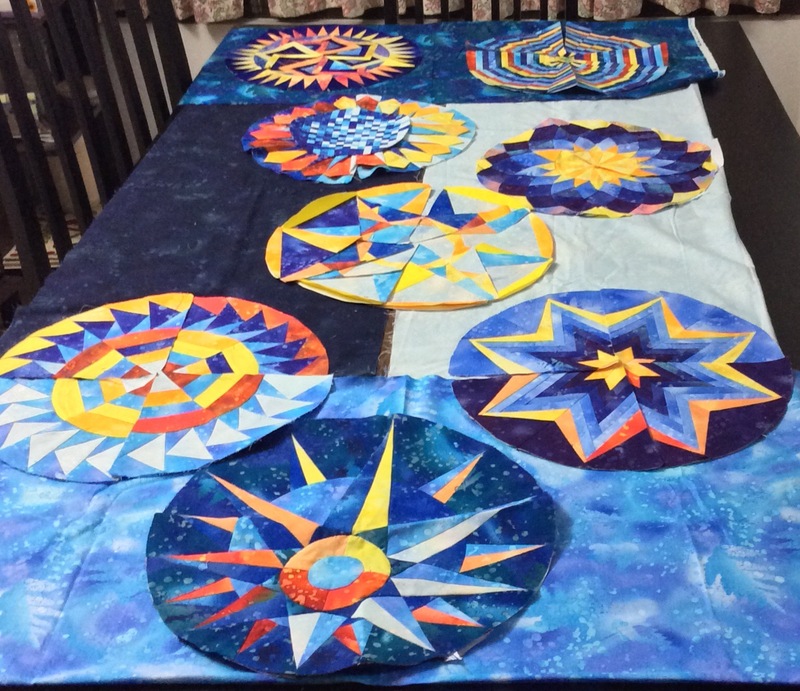 The last pending block of the Dusk Round the Year Quilt is coming up, slowly and steadily! What with pressing and trimming at each stage, the block grows really slowly! 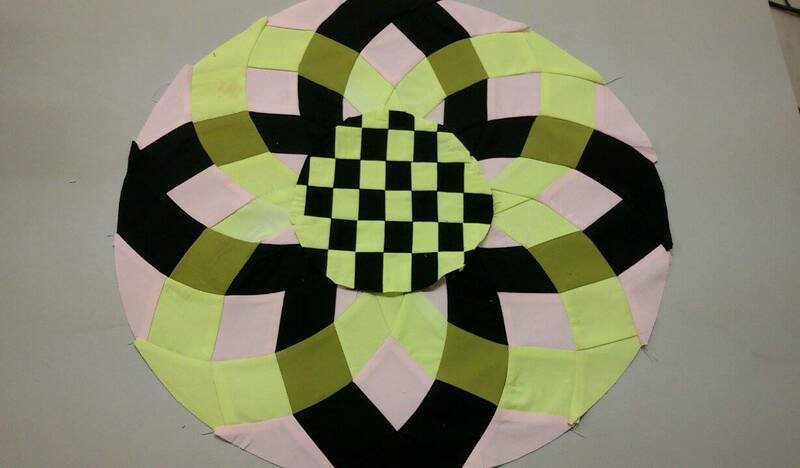 There was an error 😦 in the paper piecing templates for Lollipop Candy, the sixth of the Blocks of the Month of the ‘Round the Year’ Quilt. I have now uploaded the revised templates. But, if you downloaded the templates for this block on 24/12/2014 or earlier, you need to make a change in Template F.
– Please start piecing from piece F2, that is, treat section F2 as F1, F3 as F2…till F12, which is treated as F11. – F1 is pieced as F12. – F13 and F14 remain as heretofore. The Master Template will also show the revised Template F. However, there is no change in the assembly instructions. I am so sorry for the inconvenience! 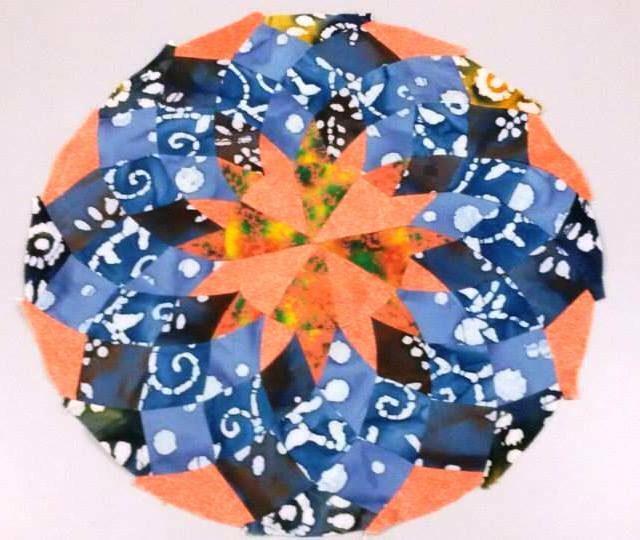 I have lots to share with you today…blocks made by other quilters, members of my virtual quilting group, Desi Quilters. So without much ado, here we go! Here are the blocks Sobana made in the last two weeks; she now has only two more blocks to make to catch up with all her pending blocks! 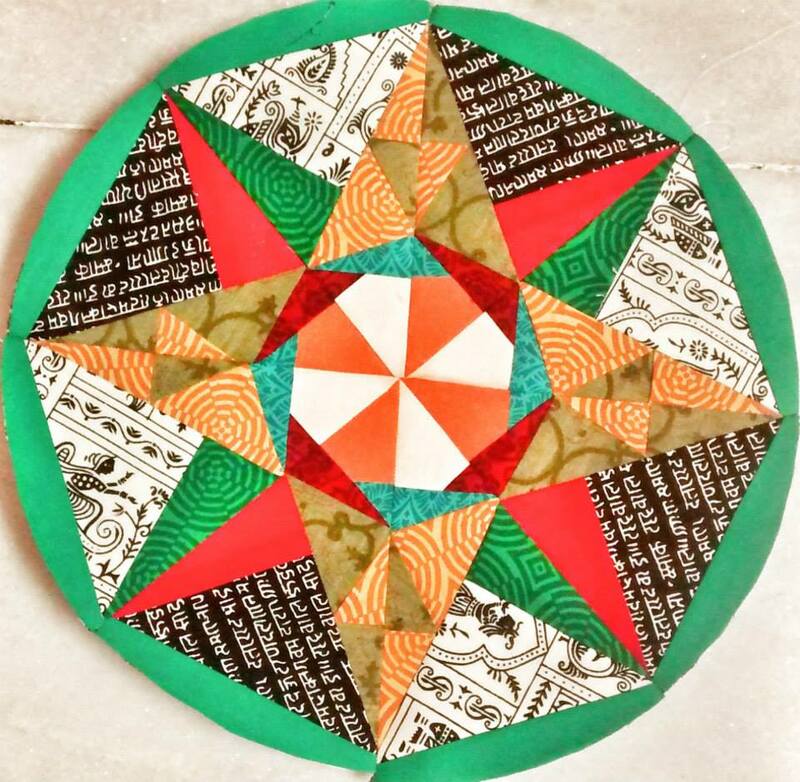 Other Desi Quilters have also been catching up! Here is a look at their blocks. Alka Goel used solids to make her Venus shine! 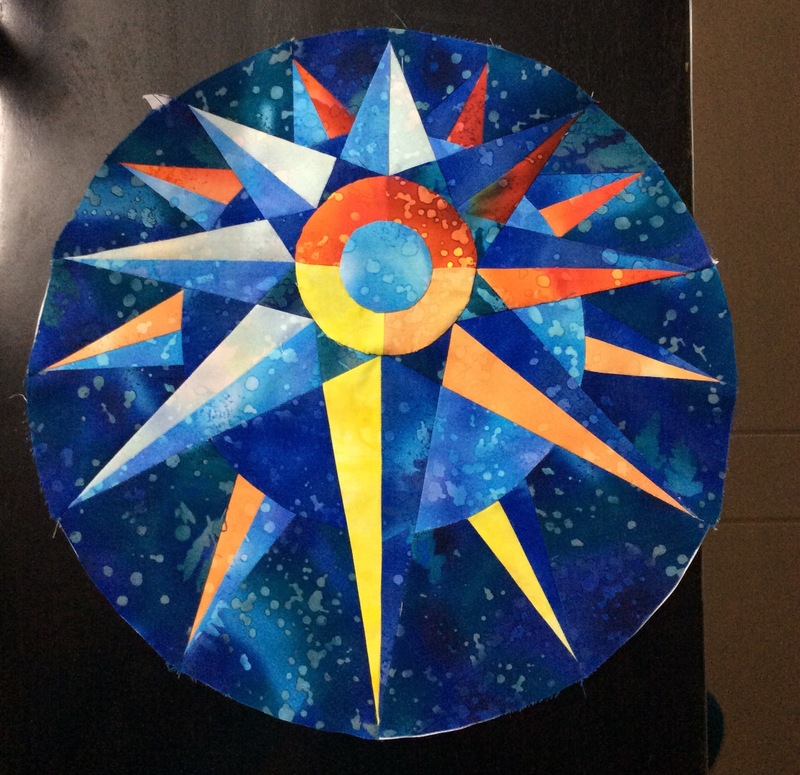 Have you made any blocks during catch-up December? 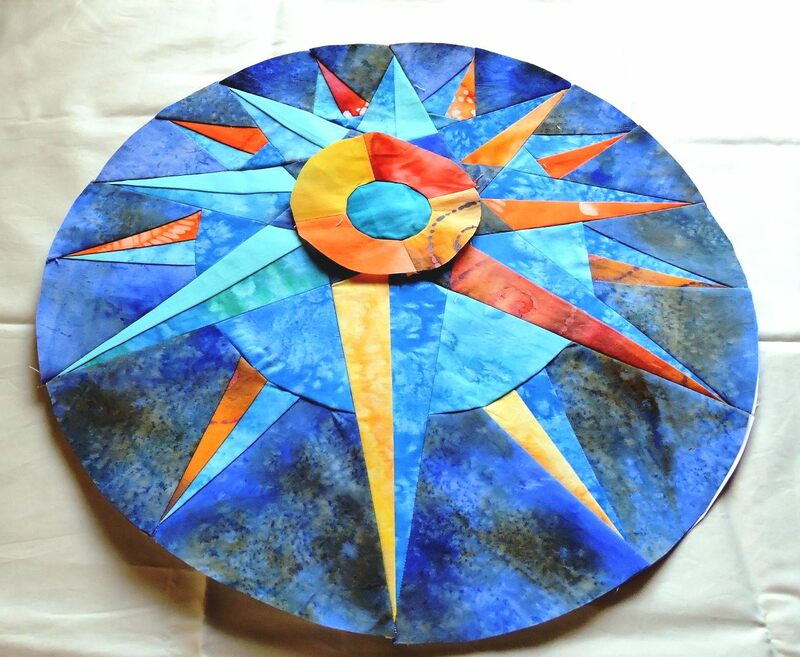 Why don’t you share your work on my facebook page Patchwork of my Life? 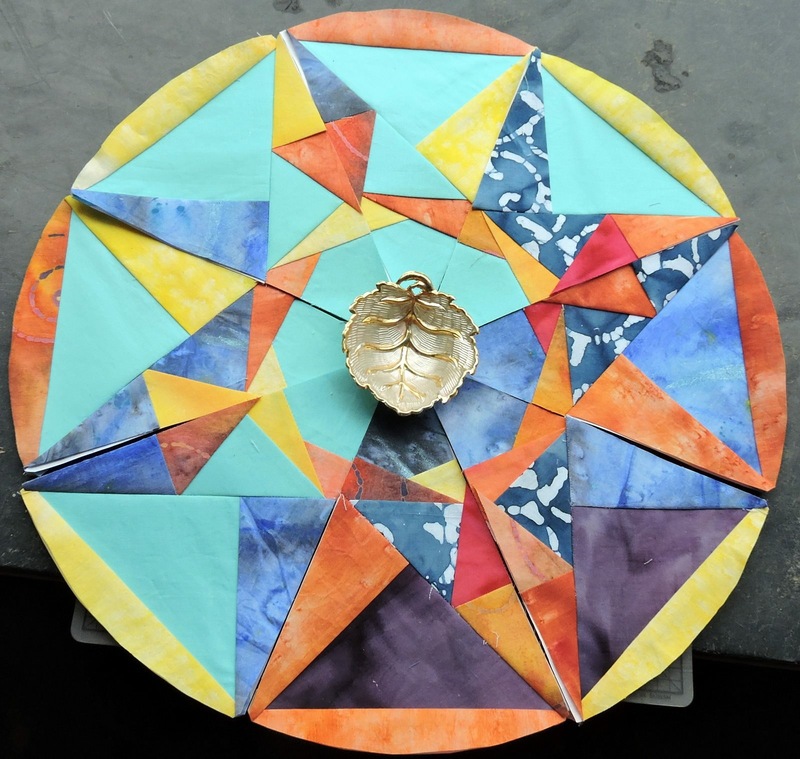 The blocks are majorly foundation paper pieced and much easier to construct than what you may believe looking at them. 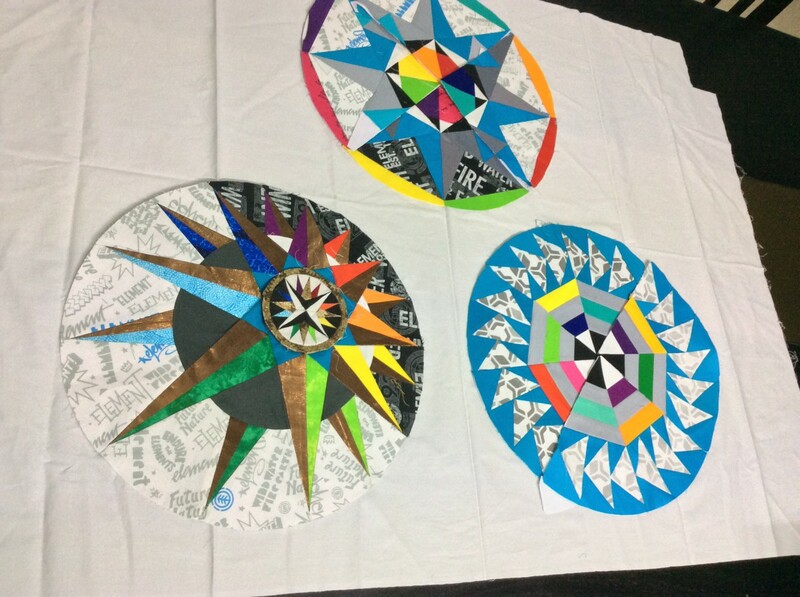 So, if you have still not started on your blocks from the Block of the Month Quilt `Round the Year’, you can head here for all the free patterns! 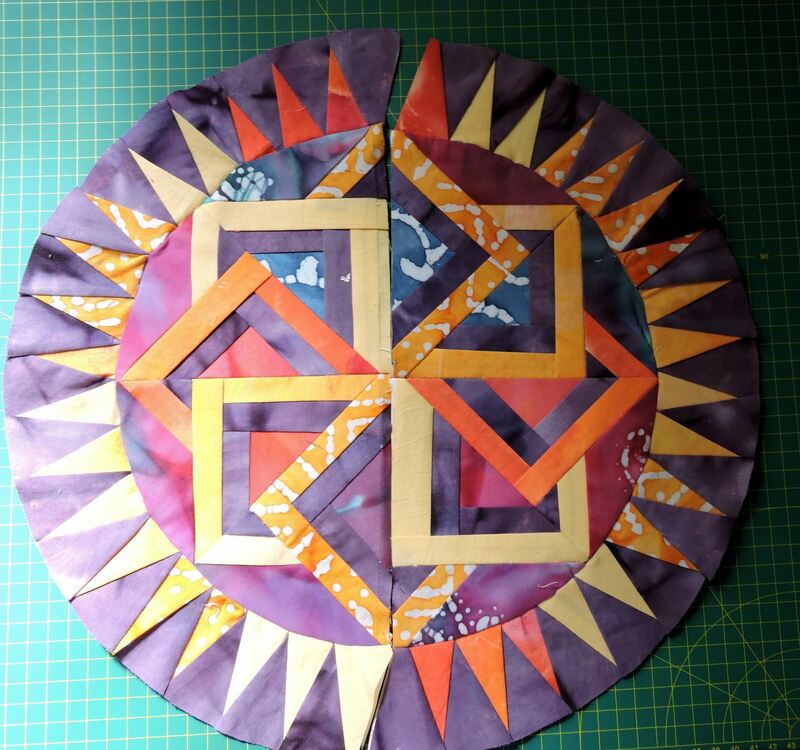 After celebrating a no- sewing day yesterday, I assembled the Southward Bound at Dusk block today. 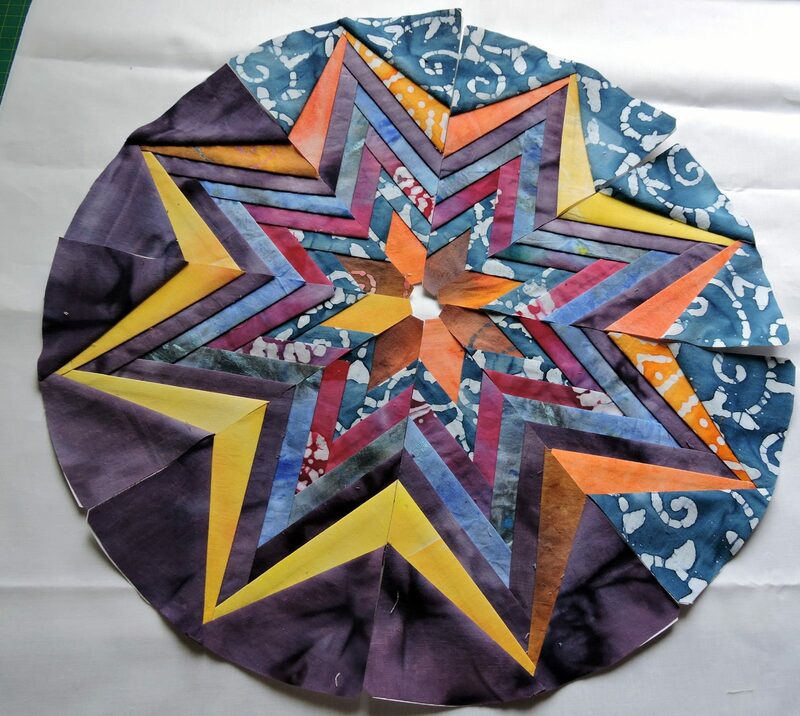 This is Block Seven of the quilt `Round the Year’ , free blocks of the month being posted on this blog from July 2013. Block Seven -Southward Bound! You get to see the block in colour only once it is assembled! These blocks are taking me about five to seven hours to make, beginning from printing to part assembly – none of them have been attached to the background as yet. Tomorrow I start work on Block Nine. 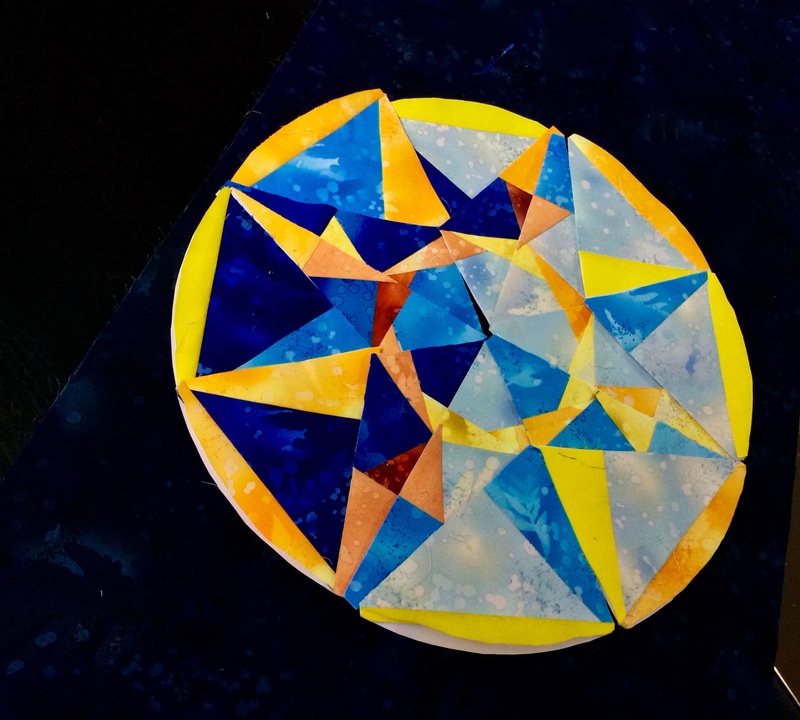 The Sapphire Fire Block is pieced, ready to be assembled. I am not very happy with it, so will put it away for some time. I may decide to change a piece or two on the lighter / brighter side. 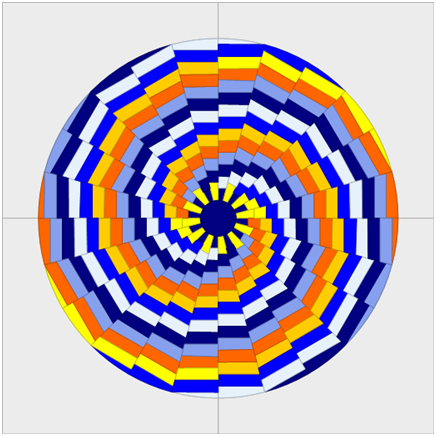 Tomorrow is the turn of the Spiral block, Lollipop Candy!